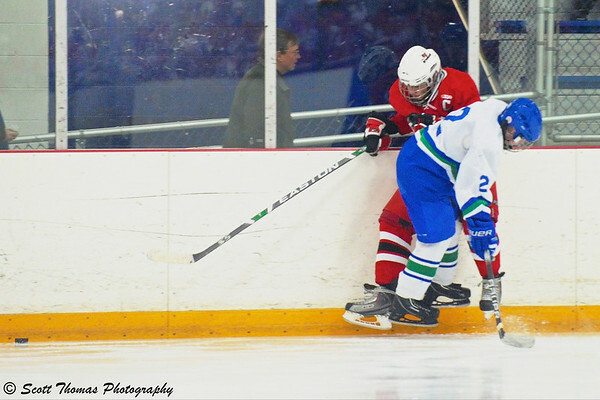 One of my goals for this year’s high school ice hockey season was to capture more peak moments. The last two years, I felt I had missed many good photos by missing those times when the action was at its peak. I knew going into this season I could not blame the equipment. The Nikon D700 camera coupled with the battery grip is capable of 9 frames per second and the Nikon 70-200VR lens I use is one of the fastest focusing lenses Nikon makes. Putting the burden squarely on the photographer, moi. With that in mind, I present photos and my commentary where I feel I captured the peak action during this season’s games. Hockey players keeping their eye on the flying puck. Nikon D700/70-200VR, 1/500s, f/2.8, ISO 7200, EV +1.3, 200mm focal length. This is one of my favorites this season. Even at f/2.8, the players and puck are in sharp focus. 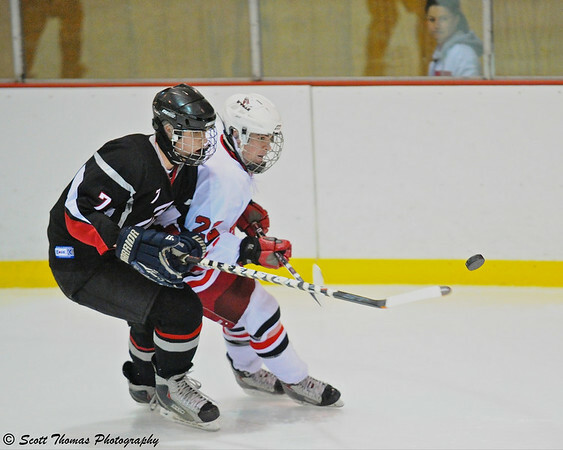 Both player’s eyes are concentrating on where the puck is going as they fight for position to best go after it. The goalie blocks the red players attempt to score. Nikon D700/70-200VR, 1/500s, f/2.8, ISO 8000, EV +1.7, 200mm focal length. The fast frame rate helped here. The red player got in alone and I started taking photos three frames before he cut to his left sharply and shot the puck. The goalie stretched out and stopped the puck with his leg pad. The white player body checks the opposing player who did have the puck. Nikon D700/70-200VR, 1/500s, f/2.8, ISO 7200, EV +1.3, 200mm focal length. 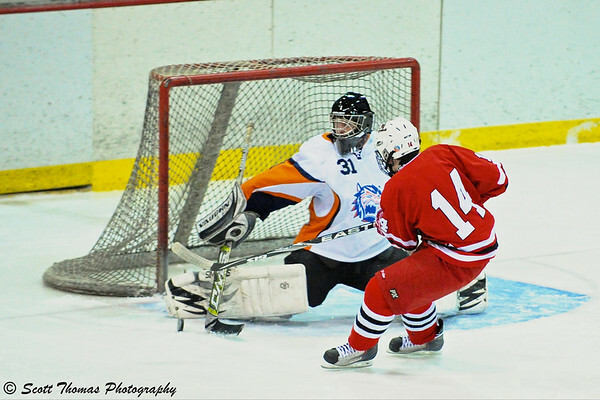 Hockey goalie making a save. Nikon D700/70-200VR, 1/500s, f/2.8, ISO 5000, EV +1.3, 200mm focal length. Hockey goalies are a big part of the action. They are a team’s last defense and have heavy, specialized equipment to help them in the task of keeping the puck out of the net. I try to highlight their work in every game I photograph. The moment after a goal is scored has peak action, too. Nikon D700/70-200VR, 1/500s, f/2.8, ISO 3600, EV +1.3, 135mm focal length. Scoring a goal is a time for a team to celebrate and this photo captures the white team raising their arms after they scored. The framing is a bit tight but I feel the excitement of the moment is still there. I do keep missing peak moments but my percentage is getting higher with each game I attend. 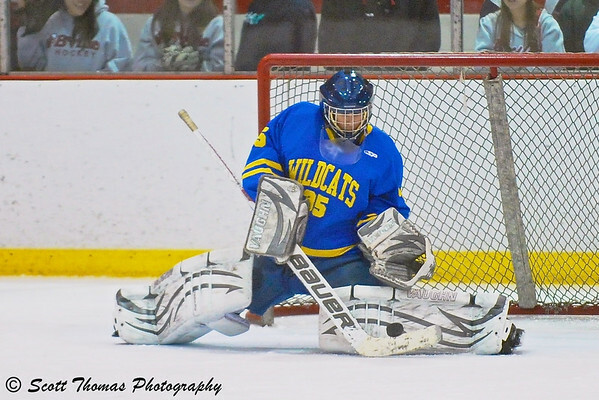 This entry was posted in Photography, Sports and tagged 70-200mm, action, battery grip, boys, goals, high school, hockey, ice, nikon D700, peak, players, puck, skates, sticks, vr. Bookmark the permalink. Those are really super! Because of the speeds involved, photographing hockey is a fantastic challenge. Nice work! It is a challenge but a lot of fun, too. The local high school team has not has a good year but they put in a good effort every night. I really like that last shot, Scott – the puck still spinning, the goalie watching it in disbelief, the offense celebrating – I love hockey. Thanks, Gerry. That was the game winning goal late in the third period. Very fine action photos, you really have captured exciting moments. Thank you, Birgitte! I keep trying and improving. Wow…from a Canadian! Thank you, Consuelo! These are excellent action shots! Your attempt at capturing peak action is accomplished! These are great shots Scott, the hockey goalie making a save image is awesome. That’s one of my favs, too, Nye! Thanks!